Philadelphia 76ers forward Tobias Harris (33) is fouled by New Orleans Pelicans guard Ian Clark (2) when passing the ball at Smoothie King Center. The Sixers did their damndest to throw a win away against the New Orleans Pelicans, but they somehow managed to time their dizzy spell well enough to pass out face first over the finish line. Behind a big night from Tobias Harris, the Sixers came up with a 111-110 victory over the Pelicans to sweep the season series. They leave the Big Easy with some more health concerns, the same questions about their bench, and a whole lot of exasperation after that one. Here's what I saw on Monday night. • There have been some exceptions on a game-by-game basis, but Ben Simmons' aggression since the start of 2019 is one of the biggest long-term stories involving this team right now. It's a bit harder for him to put his head down and just barrel through opposing players when Joel Embiid is on the floor, but take note of the way he has taken ownership of the team since the All-Star break. But it goes far beyond his jumpers. Simmons has made it a point to get into the paint and go to work against mismatches, push the pace without a true center on the floor, and take a larger share of the pie with the franchise player on the shelf. I said this after he had a dominant performance against the Golden State Warriors, and I'll say it again tonight: this is the player the Sixers need him to be every single night moving forward. He has every physical tool at his disposal to dominate the league. Hard work is going to be what determines his skill ceiling, but while he's on the way to establishing that, a little old-fashioned aggression will take him a long way. 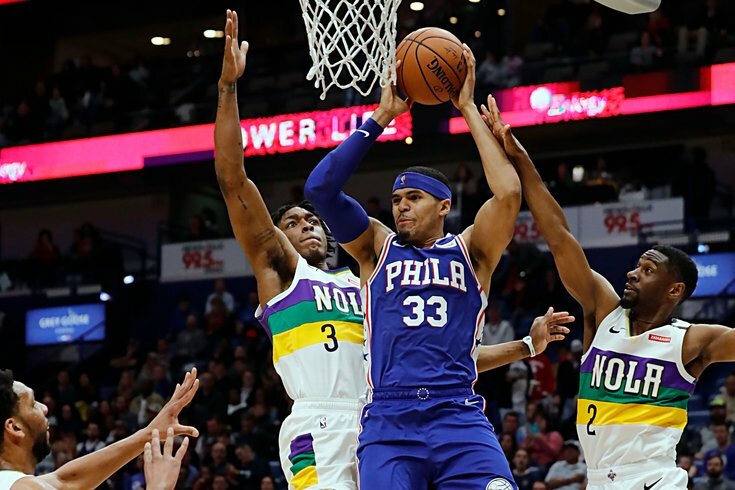 • While we had to wait a bit for Jimmy Butler to settle into a role on offense — and I would argue we're still kind of waiting on that — I think Tobias Harris has done an excellent job of blending into what Philly does without sacrificing his own gifts. He has walked a near-perfect line, and that should excite people about his potential here moving forward. It's not as though Harris is only succeeding when he's playing off of Philadelphia's elite talents. Perhaps his travels around the league have helped him learn how to adapt on the fly, because Harris has shown a knack for getting to his spots, whether that's posting up an opposing guard or cutting off T.J. McConnell for an open layup. His defensive instincts are still pretty lackluster, as you'd expect for a new guy, but his ability to attack mismatches shines through every night. This was his biggest scoring night as a member of the Sixers so far, and it's exciting to think that this is happening as he adjusts to a new situation. Big things to come. • Both big men did an excellent job of making their case for minutes on Monday night. Jonah Bolden got himself into foul trouble in the first half, picking up four fouls before he was pulled, but otherwise, he showed everything you want to see from him in limited minutes. He altered shots on defense, ran the floor, hustled for rebounds, and even had a nice finish or two as a roll man, collecting some tough passes in traffic before finishing. Boban Marjanovic certainly did his thing as well, making former Sixers center Jahlil Okafor look miniature on several occasions. I don't mean this in a bad way — I audibly laugh at least a couple times a game at plays he makes on offense, with his size making it look like he's shooting on a Little Tykes hoop. In Bolden's case, the foul trouble is rough. But Brown needs to get him minutes like this before the season ends so that he can learn to navigate these situations. If they need to turn to him in the playoffs, he will be better off having had this chance. • T.J. McConnell has looked much, much better playing in a smaller role recently. The bursts of energy are more impactful, he has been sharp on defense, and with the rest of the bench struggling recently, his production has been rather important. • If there was ever a time the Sixers could have used the best version of JJ Redick, it was during this stretch over the last week. Unfortunately, Philadelphia's veteran floor spacer has gone absolutely ice cold from deep, which sort of screws things up for the entire offense. Redick's cold spell and Joel Embiid's absence are not entirely unrelated. The chemistry of that pair is an underrated part of what makes Philadelphia go, and Embiid's screens are often the difference between Redick having a sliver of daylight and no room to shoot. • I'm a believer that teams need guys with irrational confidence to succeed in a playoff series. It's sometimes a case of living or dying by the same sword, but you need guys who aren't going to shy away from an open look when it comes to them in a tight game. That being said, Jonathon Simmons' irrational confidence feels a little unearned. Earlier in his career, he had a bit more juice in his legs, which allowed him to create separation and explode toward the basket. At this point, he has not only lost the pep in his step, but he has also regressed in a major way as a shooter. Combine those two factors and it gets ugly. I don't know who the Sixers are going to rely on off the bench in a playoff series, and an impact player ain't walking through that door before mid-April. • Jimmy Butler has been with Philadelphia too long to look this out of sorts on offense, especially when you compare how he looks to how Harris looks. He took shots far outside the flow of the offense, doing so sometimes as if to remind everyone he was still there, and the Sixers did not get a whole lot of value out of running plays through him in crunch time. If you pull up the numbers since he has arrived here, they look good from an individual and team perspective. But outside of that early stretch right after he arrived, have there been many times where you thought, "Man, the Sixers should be giddy to pay Butler the max this summer"? I think the answer is no. The playoffs are going to be his ultimate proving ground, but this marriage just feels off between Butler and the Sixers. His defensive play saved them from a potential defeat in the game's final seconds, but that didn't erase all the boneheaded plays that preceded it. • It's about damn time Mike Scott got going from deep. He has added a bit of toughness to the Sixers' frontcourt on defense, even if that isn't showing up in the numbers every night, and he doesn't need to do much on offense aside from knocking down open threes. When he's asked to do other stuff, though, it's a bit of an adventure. Scott had five turnovers against the Pelicans, and a pair of them in the first half were on plays where a passing window was open and then closed before he even threw the pass, only for Scott to try to force the ball into the window anyway. He has to be better. The shooting is good, but it can't be everything. • I know I praised Bolden up top, but man, you can't be taking early-clock threes with under five minutes to go in a close game. That's a good way to get seated on the bench for the rest of eternity. Just as dumb: Philadelphia using their foul-to-give with 19+ seconds on the clock straight off of an inbounds play for New Orleans. What's the point of that? • If the Sixers take care of the basketball, there's no chance that game is even close. • The kids you could hear screaming on the broadcast during Sixers free throws were horrendous. I'm all for freedom of speech, but high-pitched screams like that deserve a muzzle. • Injuries can happen in pretty much any game at any time, but man, you can't help but feel that Boban's injury could have been avoided if the Sixers had simply closed out the game sooner. Instead, the Pelicans had everything to play for down the stretch, and Boban got tangled up inside with both teams fighting hard for a victory. Let's hope that's not as serious as it looked.